The European Union’s Horizon 2020 Programme for Research & Innovation has been running since 2014 and has supported over 11,000 projects totalling about €20 billion of funding so far. Many project consortia consist of a combination of universities, research organisations, public bodies, small businesses and corporates. Next to their generally large Research & Development budgets, many corporates benefit significantly from funding through participations in the programme. Which European corporates have benefited most from Horizon 2020’s funding so far, and how are they connected? Viewing this on mobile? Click here to view the visualisation full-screen. Horizon 2020 consists of three main pillars: Excellent Science, Industrial Leadership and Societal Challenges (see here for further details). Of the just over 11,000 projects across these three pillars, about 5,400 include participation of at least one for-profit organisation (corporates as well as small- and medium-sized business). About 86% of these projects focus on either Industrial Leadership or Societal Challenges – which makes sense, since many of the projects under the Excellent Science pillar are focused specifically on scientific research. Large European corporates make up a significant part of the for-profit entities which benefit from Horizon 2020’s funding. Within their Research & Development departments, these corporates have direct access to knowledge and technology which can be readily utilised in European-funded research projects. Let’s take a look at the available data and apply the principles of network analytics to gain insight into which corporates are big receivers and how they are connected based on the projects they jointly participate in. The data used for this analysis is available openly from the EU’s Open Data Portal and consists of two main files: an overview of the projects in Horizon 2020 so far, as well as an overview of all participating organisations. Both files include extensive metadata, including for example project identifiers, titles and overall cost, as well as organisations’ locations, contact details, received funding per project and activity type. The latter bit of metadata was used to extract all private for-profit entities, resulting in an initial total of 10,357 organisations. Upon inspection of the data, it became clear that many corporates receive funding through various entities or country subsidiaries. For example, German conglomerate Siemens received funding through its Dutch, French and Italian subsidiaries, but also directly to its Healthcare and Wind Power divisions. To get a better view on the overall funding received per corporate, the various subsidiaries and divisions were therefore merged into one value. At the same time, different writing styles for the same organisation (for example, including and excluding ‘Ltd’) were taken care of as well to improve the quality of the data. In the end, the final dataset then consisted of 9,786 organisations. 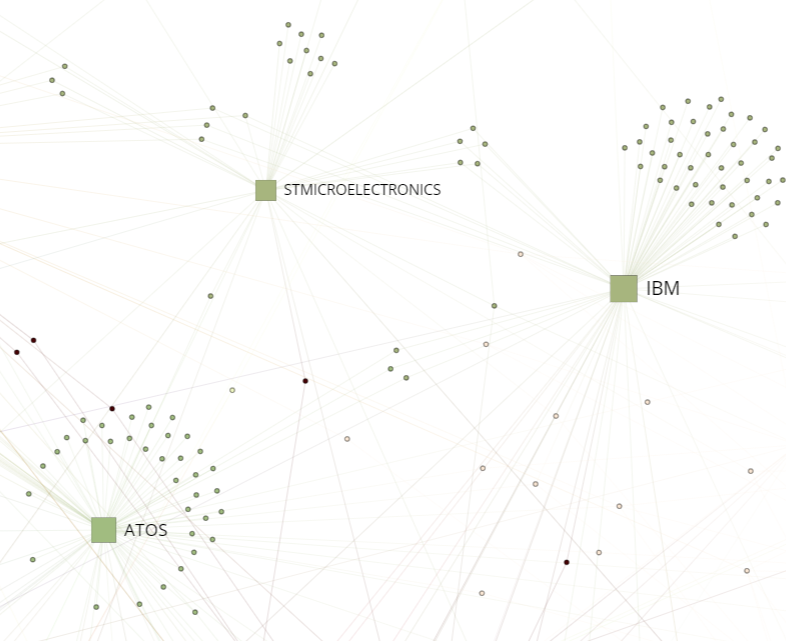 The interactive visualisation above shows the corporates which have received over €5 million since the start of Horizon 2020 in January 2014. Each corporate is connected to the projects it has participated in, which allows us to see the interconnections between corporates based on shared project participations. 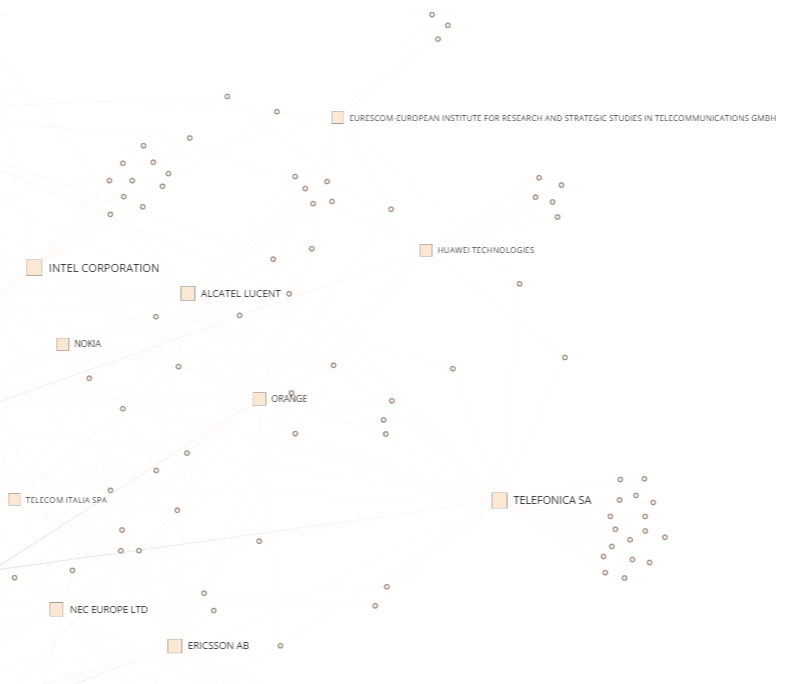 The larger a node, the more funding the corporate has received. Colors reflect clusters of related nodes based on their interconnectedness and were calculated using the Louvain community detection algorithm. You can click any node to view further information as well as an overview of its connections in the panes at the right. The visualisation shows us that Siemens received most funding through Horizon 2020, totaling over €67,5 million over the past three years. 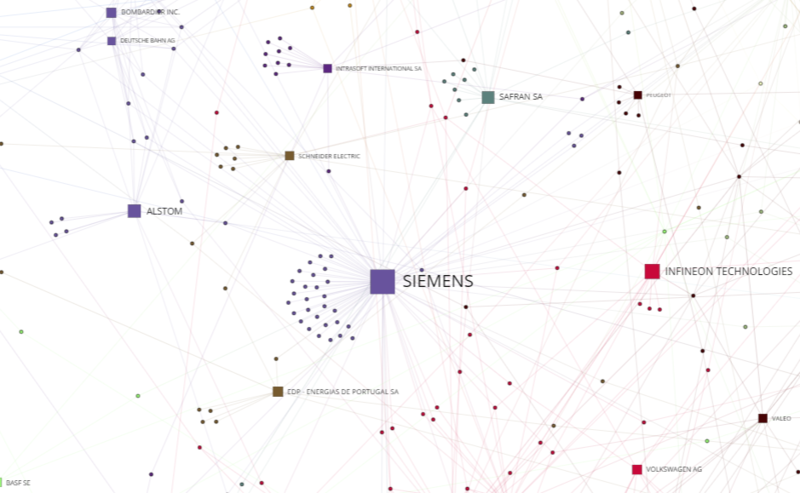 Its central position in the network indicates that the projects in which it participates vary in terms of topics: when clicking the Siemens node, you’ll see that the projects connected to it are scattered around the network. The Connections pane at the right shows you the titles of each of the projects – clicking a title shows you its associated Horizon 2020 Programme and a link to the CORDIS project website. The Dutch Philips, a competitor of Siemens in many sectors, received about €27,5 million. Number two in terms of funding received is French electrical systems specialist Thales: across the 123 projects it participated in so far, it received about €65,3 million in funding. 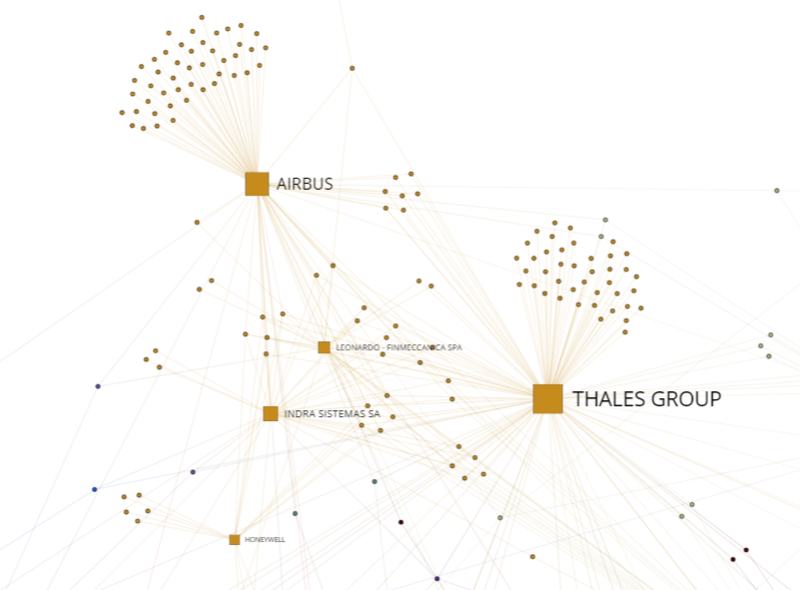 In terms of clustering, Thales is located in a clearly identifiable group of corporates and related projects at the top of the network. It shares many projects with Airbus (which received over €40 million in funding), many of them focused on flight and space applications. The network is made up of a wide variety of clusters which can be related to specific technology: for example, the cluster above focuses on telecommunication and includes the likes of Intel (~€13 million), Telefonica (~€12 million), Ericsson (€9,7 billion) and various other significant players in this industry. 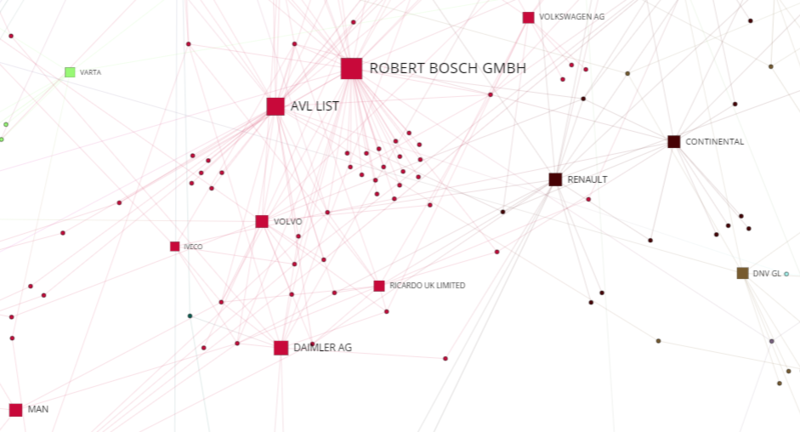 Another big receiver is Robert Bosch (~€35 million), a key supplier to the automotive industry. Many of the corporates surrounding it are indeed active in that sector as well, including Austrian AVL List (a major manufacturer of powertrain systems, ~€23,6 million), plus car manufacturers Daimler (~€14,4 million), Volvo (~€10,8 million) and Renault (€11,7 million). Large corporates active in IT and semiconductors also do well in terms of funding received: the French Atos received over €35 million, IBM received approximately €41,3 million and French-Italian STMicroelectronics secured almost €24 million. In comparison, Dutch semiconductor specialist NXP received just over €8 million; German Infineon Technologies benefited from over €22,5 million so far. As we can see from the above, looking at this data from a visual network perspective provides us with insights we could not easily obtain when simply analysing the data from within a spreadsheet. The network allows us to clearly distinguish clusters of activity, determine which corporates have worked together on which topics, and see how central certain corporates are located as opposed to their peers. Coupling this with information on total funding received per corporate, this provides us with a pretty unique view on how corporates augment their already significant Research & Development budgets with European funding. Interestingly, this perspective is often overlooked when analysing research & innovation funding data: most of the focus is on universities, research centres and government bodies, without a specific focus on the role of corporates. If you have any further ideas based on this dataset or any interesting insights from the analysis presented here, please feel free to reach out! This would be very helpful for me. Thank you so much in advance. Thanks for a very interesting analysis! I’m wondering about the selection process where you only select the private for-profit entities in the data. I assume that the database also includes academic institutions, and other non-profit entities? What does a network map of these actors look like, and what’s their comparative success in accessing funding from Horizon 2020? Thanks for your comment Victor. The database does indeed also include academic institutions, research centres and various other types of organisations. The focus for this analysis was private for-profit entities, but similar maps can be made for other actors. See for example this one, which maps UK institutions connected to their projects: https://www.kenedict.com/network-science-reveals-brexits-impact-on-the-uks-research-ecosystem/. Comparative success or performance of different types of actors could e.g. be measured by total funding received, total number of projects participated in, total number of coordinated projects, number of collaboration partners, etc. These metrics were however not included in this analysis and the Brexit example, but can be added in a quite straightforward way. Hope this helps.